Detail: Let’s get a good start on the Christmas holiday with a dinner and concert. Sit back, relax and enjoy yourself as we serve a full Christmas dinner with the sounds of Christmas putting you in the holiday spirit. Tickets are $10, with limited seating, so call or stop in to reserve your seats. Detail: Cash Mobs are the perfect way to shop local, have fun, and meet new people in our community all at the same time. Each Cash Mob event focuses on supporting local business in downtown Marietta. Once participants show up at the initial meeting location, clues will be provided to learn the surprise location(s) of the evening’s Cash Mob event! No participant walks away empty-handed, whether it’s a refreshment, discount, sticker, or goody bag giveaway. All Cash Mob participants are asked to spend a minimum of $10 in each location. Detail: Join Makerspace instructor Mr. Steve Foutty on Monday evenings during the hours of 3:30 pm and 7 pm. This opportunity is for training and safety, and is designed to prepare makers for best practices and becoming members of the Epicenter Makerspace. For more information call 740-370-6399, or email Makerspace Coordinator: bb2cmakerspace@gmail.com, or stop by any Monday to check it out! Detail Have a picture/poster of an odd size that needs a frame? Make your own at the Makerspace. Through the creation of the frame you will learn to use a table saw, planer, router, and chop saw. Detail: Discover how to improve thyroid function, reduce your need for medication, lose weight without exercise, increase your energy levels, stop losing sleep and avoid symptoms of depression. Detail: Tired of the same holiday dessert recipes? Join us at The Changed Plate to update your holiday dessert repertoire! Cost: $10 per person. Space is limited, call (740) 568-4731 to register, pay and reserve your spot in class! Detail: The anticipated annual Christmas with the Choirs will be on Wednesday, December 5th this year! As always, this popular concert will take place at the Basilica on 4th street. It is free and open to the public. Doors open at 6:15pm, concert at 7. This year’s concert will feature all Marietta College choirs, string quartet, the Marietta Children’s Choir, and the Marietta City Schools Elementary Choirs, including two combined numbers with ALL choirs in attendance! Don’t miss it! Detail: Welcome to our Anti-Bullying Club, Youth 2 Youth. The club is highly interactive and teaches students the tools and skills needed to deal with bullying, through role playing, guest speakers, activities and/or exercises. It will be delivered 90 minutes per week until the end of the year. Each lesson could have a short assignment/discussion for each of you to discuss with your child on a weekly basis. Students will receive their assignment/discussion at the end of each session. Detail: Live stage production by Veritas Classical Academy It’s a Wonderful Life is the tale of George Bailey, the “Everyman” from the small town of Bedford Falls, whose dreams of escape and adventure have been quashed by family obligation and civic duty and whose despair has prompted his guardian angel to descend on Christmas Eve to save him. What would the world have been like had George never been born? George soon learns that his has been, after all, a wonderful life. This faithful adaptation has all your favorite characters: George and Mary Hatch, Clarence, Uncle Billy, Violet, and, of course, the villain, Mr. Potter. Detail: Live Christmas Auction with auctioneer Madison Williams will feature themed gift baskets, crafts, holiday home decor, delicious homemade Christmas fudge, and more! Detail: In this introduction to pen turning you will leave with a basic understanding of the steps required to creating your very own wooden pen. Detail: Our Free Friday Community Meal entree includes pork roast. Detail: This class is as easy as 1-2-3! Each student will receive an 11×14 inch canvas with step-by-step instructions using acrylic paints. This is a fun class where experience is not necessary. Class cost – $15 + 25 material fee. Pre-registration is required. To find out more or register, visit www.wvup.edu/communityed, e-mail wed@wvup.edu, or call 304.424.8383. This is a community education class provided by West Virginia University at Parkersburg to offer you fun and affordable learning opportunities. Individuals do not have to be a student of the college to register. This class will take place at the WVU Parkersburg Workforce & Economic Development Building. Detail: Lace up your sneakers and join us every Saturday for Walk with a Doc.This is a free provider-led walk that will begins with a 3-5 minute educational conversation. The walk starts on our Wayne Street Medical Campus (pediatric building, 310 East 8th Street in Marietta) will follow the Marietta River Trail for one hour, but participants do not need to walk for the full hour, and may walk at their own pace and distance. For more information please contact Dr. Tom Bartsokas at (740) 374-6030. Detail: Join us for some holiday fitness and fun! Our fun-filled event includes: -Demos of Fitness Classes offered at the studio (POUND, Strong By Zumba, Floor Barre, Barre Above, AMPD Resistance, Yoga and VeraFlow). VeraFlow 12:10-12:30 PM Yoga -Vendors to help you find the perfect gift for everyone on your list in between classes. -Refreshments provided in between classes. -It is $15 to pre-register for the event. If you would like to order an exclusive event shirt it is an extra $10 and your registration must be received by November 27th. – The cost to register at the door is $20 – no extra shirts will be available. Detail: Join us for some Adult Holiday Fun at Gator’s Easy Wind Pub. Santa will be IN THE HOUSE!!! Your Ticket will get you into the party, a gingerbread house building kit, and a drink ticket! Tickets are $15 each, and we do have a limited amount available. Tickets are available online via PayPal, or at the pub during normal business hours. We can’t wait to celebrate the holidays with you, with some ONE OF A KIND Gator’s fun! Detail: Come to the Campus Martius Museum for a morning of Christmas magic on Saturday, December 8th! Read stories, make a tasty craft, play holiday games, and even meet Santa Claus. For children ages 3-6 years old Registration is required. To sign-up, stop by the Children’s Department, or call us at 740-373-1057 ext. 219. 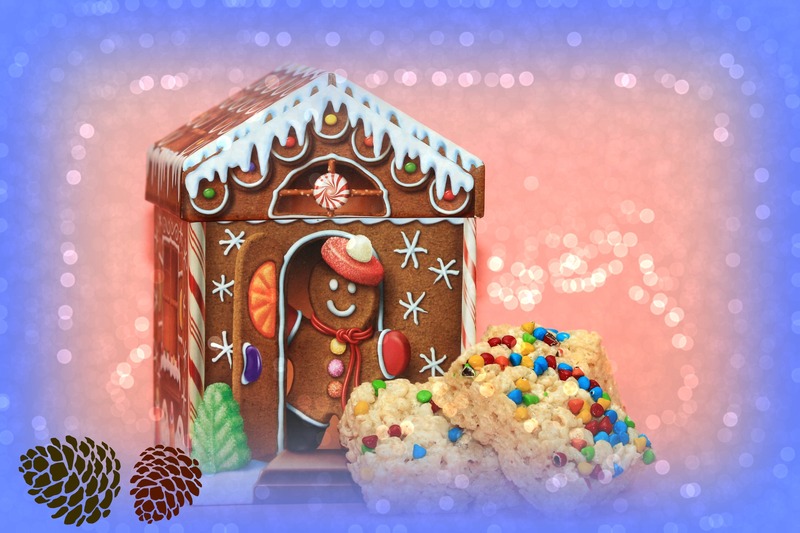 Detail: Stop by the library for a fun afternoon of creating your own gingerbread house! We’ll build a house and decorate it as you want. Listen to Christmas music while you craft and enjoy a tasty holiday treat! For children ages 7-12 years old Registration is required. To sign-up, stop by the Children’s Department, or call us at 740-373-1057 ext. 219. Detail: It’s Not to late to register! Make -up Evaluations & Cheer Orientation is Saturday, December 8th at the North gym anytime between 10am & 12pm. Detail: Santa Claus will be riding our fire truck around Devola, collecting food donations for Gospel Mission Food Pantry. Santa will travel along the main streets. Come let the kids see the big guy in red and bring a non-perishable food item. Detail:Embrace the magic of the holidays with a stroll through our beautifully decorated community. RSVP to 740.864.8637 by Dec. 3 to reserve your spot! Detail: Join Harmar Place, 401 Harmar Street, Marietta, for an Opening Minds Through Art (OMA) art show. OMA is a Scripps intergenerational art program for people with dementia that aims to promote social engagement, autonomy and dignity through the experience of creative self-expression. Detail: GFWC BWC is again hosting an Indoor Christmas Holiday Tour. Walk through four Belpre homes to view the owners’ unique decorating style. Visit Stahl’s new Christmas Shop and Veteran’s Gallery. The Gallery depicts the story of the military service of President George H. W. Bush in the original artwork of Thomas Stahl. Join us at Farmer’s Castle for refreshments and learn about some of Belpre’s history. Tour Books are $5 and may be purchased at Unicorn Wine Guild, Belair’s Bistro, Bob’s Market, at any of the stops on the Tour, or from any Club member. Detail: Join Brenda and Melody for this one of a kind event!! and a few simple yoga stretches designed to relax and get your creativity flowing! Then, while enjoying cookies, hot tea and cocoa, we will create this ADORABLE FROSTY FABLES book for your holiday decor or to give as a gift! $30 covers all supplies, refreshments, and instructor fees. Space is limited to 15, so please sign up early! Detail: Visit the castle this holiday season as we bring back our Kingdom of Lights! Join us nightly at dusk for this magical journey. Stroll the property, see the castle decked out with over 100,000 lights, take pictures with our outdoor Christmas tree, and listen to Holiday music playing throughout the property, have dinner in our restaurant. Even Saint Nick himself will make the occasional appearance. Santa will be visiting every Saturday and some Fridays, November 17th – December 22nd 6PM-8PM (excluding 12/15 the property will be closed on 12/15 for a private event). Select Friday nights there will be Christmas Carolers. When: Nov 30th at 4 PM-10 PM and running in December too! pen 4pm-10pm every Friday and Saturday, specifically: Nov. 23, 24, 30, Dec 1, 7, 8, 14, 15, 21, 22 for 2018. Free admission, but a $1 per person donation is APPRECIATED. Not handicap accessible, but we have special handicap hours for a exclusive drive through tour on these two date/times only: Saturday, Dec 8th and Friday, Dec 14th both 130-4pm only. We feature 16 indoor full-size display scenes, a mini planetarium, 2 fun tunnels, a Gift Shop, thousands and thousands of Christmas lights, outdoor displays, a walking trail to our cascading pond, 4 new parking lots, and an all-over spirit of Christmas! Your new Christmas traditions start here! Detail: We will be presenting a FREE night of fun on Tuesday, December 4th from 2pm until 7pm and you’re invited! Guests will have free access to the Avampato Discovery Museum and Juliet Art Museum with exhibits that include Da Vinci Inventions, Art Space, My Town, Ashton’s Climbing Sculpture, Healthy Me, Water Works and the Maier Foundation Music Studios! Free day is possible with grateful recognition to Deborah Carper. Detail: Excited for another year of the Charleston Lighted Boat Parade!!! Boats will line up around the Patrick St. bridge and will depart from there in between 5:00-5:30pm. The parade will proceed to the Capitol and then turn around to conclude at Haddad Riverfront Park….where we will join the Annual “Light Up the Levee” event. Please Share!!!! Everyone is welcome!!! Detail: Receive a complimentary professional photo at the Central Park Fountain this holiday season. Photos are dependent on weather. Detail: Crystal Gayle comes to the historic Peoples Bank Theatre! Inducted into the Grand Ole Opry in January 2017 by her sister Loretta Lynn, Crystal Gayle is the first female artist in country to reach platinum status with more than 20 number one hits. Renowned for her classic recording of her timeless signature song Don’t It Make My Brown Eyes Blue, Crystal Gayle also scored with her multi-format hits You’ve Been Talking In Your Sleep, When I Dream, Half the Way, and her duet with Eddie Rabbitt, Just You and I.